Well, as I hinted, my 5th half marathon went pretty well. It's crazy because I'm signed up for 4 half marathons ALREADY for next year #crazyrunnerlady. 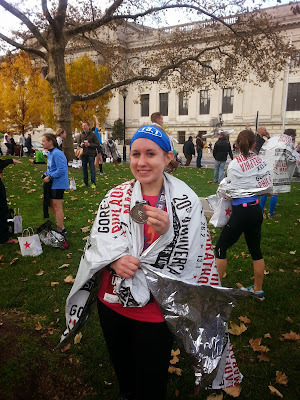 I was super nervous because honestly I have been in a running funk post-marathon. I had two weeks of recovery of not doing a whole lot of anything and only a handful of runs after that, the longest being 7 miles. Even though I'd tell myself "c'mon Lauren, you ran a freaking marathon, you've got this", I was still super nervous. I knew I wasn't going to PR or anything, but for my pride I didn't really want to run my slowest half ever (running my first in 1:48 was a mistake, damn). I went to the expo Saturday afternoon, down at the convention center at Philly. The whole area of the city was packed because there was about 30,000 people running the marathon/half marathon. I was a little confused when I walked in but soon walked right up to grab my bib and shirt and bag. The shirt is a nice long-sleeve baby blue shirt with the course map on the back. It's going to be great for winter running! They had lots of nice merchandise, but I exercised restraint and only came out with a knit beanie, which is my new favorite accessory to cover up bad hair days! There were the usual running stores, snacks, and brands selling merchandise there.Overall, it was a great and organized expo experience. 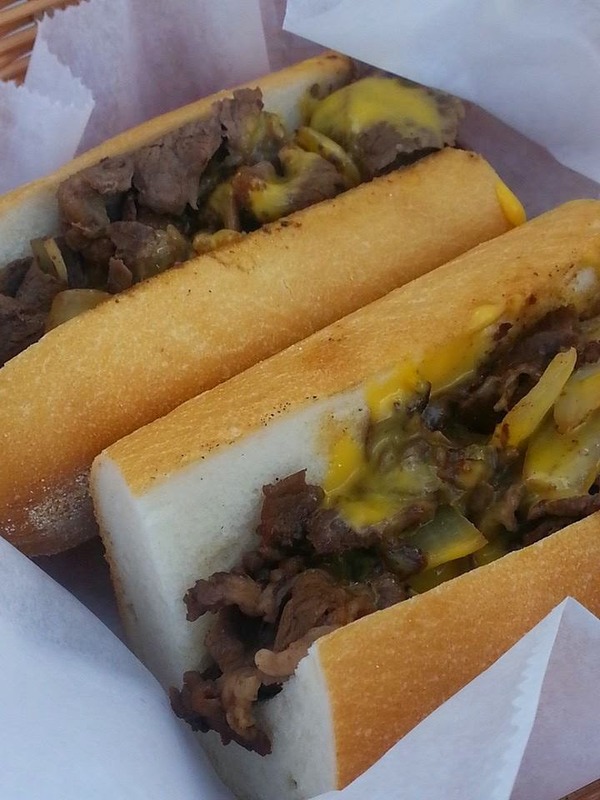 Afterwards I carbloaded at Campo's in Old City, with a Philly cheesesteak, aka the best way to carbload. I love Philadelphia so much. There was lots of talk about all the extra security and bag checks runners and spectators would have to go through so I was nervous about arriving downtown in the morning. My boyfriend ended up dropping me off at the closed Ben Franklin Parkway exit off of 676 around 6 AM, which dropped me right at the starting line around 6:10 AM. I didn't have a bag because I didn't want to mess with any of that, but it seemed like it would have been easy anyways. The weather was overcast and in the 50s but not as cold as I had thought it would be (thank goodness!). I had gloves and an extra throw-away shirt on over my shirt, arm sleeves, compression sleeves, and capri pants. Eventually the race started, and I was excited. The half marathoners and marathoners all start together so that was exciting. I wish I would have worn my marathon shirt from Baltimore to fit in because I seemed to be surrounded by speedy people in the Black corral. I got to high-five Mayor Nutter of Philadelphia as I crossed the start line. I told myself to get an easy pace for the first half of the race so I was running around 8:00-8:15 minute miles. It was exciting to be running downtown along streets I knew with TONS of spectators cheering. The race course was pretty nice and started and ended at the Ben Franklin Parkway/Art Museum area (yes, the Rocky steps!). I was surprised by how many spectators there were, especially on a chilly day! The course was fairly flat until some little hills at miles 7 and 8 and then a big hill in Fairmount Park around Mile 10 that lead to a nice big downhill! I started to speed up and felt good. Marathon training taught me a lot about racing strategy and discipline so I made sure to switch between water and gatorade at almost every water stop and even took a Gu at mile 6. My legs weren't bothering me too much from being tight and I ended up running a negative split! I was really pushing it in the end and ran one of my speedier half marathons! Pushing my pace as I got to mile 12, I thought there would be no way I could have run the full today, as the half marathoners went to the right towards the finish, and I watched all the full marathoners go to the left to make the trek towards Manayunk. As I made it down the last stretch towards the finish line I found my boyfriend cheering for me and yelling that I was going to PR. I laughed because I knew that wasn't true and was wondering what he thought my PR is (he was about 5 minutes off, good job). I ended up with an overall 7:50 pace and my second fastest half marathon time-WOOHOO. I LOVED the Philadelphia post-race runner's area-Baltimore needs to take some notes. I got my medal and some water and gatorade pretty quickly. There was lots of space to walk and stop. Then for the food you could pick up bananas or oranges but were handed a bag with all the other snacks. It was great to not have to wait in a long line and to have a bag to put all my crap in. It seemed the gear check pickup was pretty organized and easy to access too. They had post-race massages which I decided to forgo because I had to go to the family reunion area to get my phone from my boyfriend. It was the first race my parents went to-even though they made it right at the end ,but it meant a lot to me. It seems everyone thinks I'm a big runner now after running a full marathon even though I've been racing for like a year and a half. It's nice to have people support you and wake up early to go stand out in the cold to watch you run by. My calves were sore afterwards, and the rest of the day was full of brunching, napping and watching football. Overall I thought the Philadelphia half marathon was a great experience. Maybe I'll come back for the Full one of these years! fast little thing! Congrats! i'm a Georgia girl but love Philly!!! Jealous! Thanks! I'm in MD now but will always call Philly home. It's such a great city! Whattttt this is awesome! I always find it funny when my friends think I had some crazy race when really it wasn't quite my PR. Although for running a half a month after a full, I would say that is an AWESOME time! Something to be excited about for sure. So now we really have to have a froyo/pizza/anything date before I head home for Christmas! Thanks, lady! Yeah my parents thought I was doing the full. I was like um, you know I trained 4 months for 26.2 miles right? Yes you got my number so hit me up-I'll be around all weekend and a couple days next week! Thanks! I overheard a guy at Philly before the race (who has run a TON of marathons and all the bigs ones) say Richmond was still his favorite ever. I might need to check it out! I have heard awesome things about Philly! When I lived in DC, I really wanted to get up there to do it... now that I'm midwest, I'll leave it as 'someday'. So glad you had a wonderful race! Thanks! That's a great PR too! Ah, I'm always running down in DC now since I'm so close to it. Definitely put it on your bucket list if you ever get out here-super great from expo to finish! Congratulations! Looks like an amazing race, and way to go on your time! Congratulations! I can feel the energy of the race and your accomplishment! Nice pace! Welcome to 14 in 2014 too! What distance are you running? Thanks, good luck to you too. Races do get expensive-argh, otherwise I'd run them all! Yay, thanks for checking back! I was glad the race went well-I'm looking at doing the full sometime in the future but have my eye on Chicago tomorrow!